For almost everyone, perhaps one of the most overworked parts of the body is none other than the feet. From the moment you wake, going to work, coming back home and returning to bed, the feet and legs do most of the work and carry your weight all day long. This is why when areas associated with the feet hurt, everything can be disrupted. One of the common foot related ailments people complain about is swelling of the ankles. For those afflicted with it, the usual daily activities can become a tad harder to accomplish. While there are lots of problems attributed to swollen ankles, one of the most overlooked causes is the possibility of the existence of varicose veins. Varicose veins are characterised by gnarled, enlarged veins which are usually seen on the legs and feet. Although they do appear in other places on the body, feet and legs are the most common areas. This is due to the fact that standing and walking for long periods of time increases the risk of developing varicosities, thus the lower part of the body is commonly affected. For some people, spider or varicose veins are more of a cosmetic concern because of their prominent appearance. There are many serious cases, however, of ongoing pain and discomfort, which can further lead to more serious issues and complications which could put you in the hospital. They may also be signs of circulatory problems, thus consultation is often advised if you suspect you may have a vein problem. Having swollen ankles is one of the effects of varicose veins. Patients with these types of veins suffer from venous insufficiency, where blood is unable to move back up to the heart efficiently. This causes the blood to leak back down the vessels, retaining fluid in the soft tissues of the lower legs, and that includes the ankles. 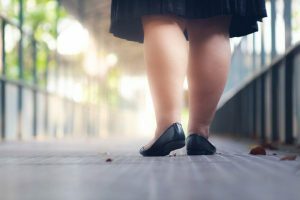 This is why swollen ankles are related to varicose veins, and the two symptoms combined on a patient may have been overlooked as being related. As far as treatment is concerned, doctors tend to advise clinic options other than surgery, as most cases are alleviated by modern procedures, some of them delivered via laser treatments. Some post procedure solutions may be lifestyle changes, such as avoiding standing for extended periods of time, losing or maintaining a healthy weight, and exercising to improve circulation. Compression socks or stockings can also help with the blood flow and address swelling. Follow our compression sock guide for more information. Having swollen ankles can be a real pain, but being aggressive with one’s health can help alleviate any symptoms.